Scotty McCreery made a dream come true for 16-year-old Sadie Robertson of the hit A&E show Duck Dynasty. Scotty McCreery played Sadie Robertson’s recent birthday party after spending an afternoon mudding with John Luke Robertson and enjoying Miss Kay’s home cooking. The June 17 sweet 16 bash took place at a vineyard in West Monroe, Louisiana. Us Weekly covered the party for their most recent issue, and in the magazine, fans get a glimpse of the fun, which included Willie and John Luke Robertson joining Scotty McCreery for a version of Man of Constant Sorrow. According to Country Music Rocks, Scotty McCreery and the Robertsons first met before his recent performance at the Grand Ole Opry. 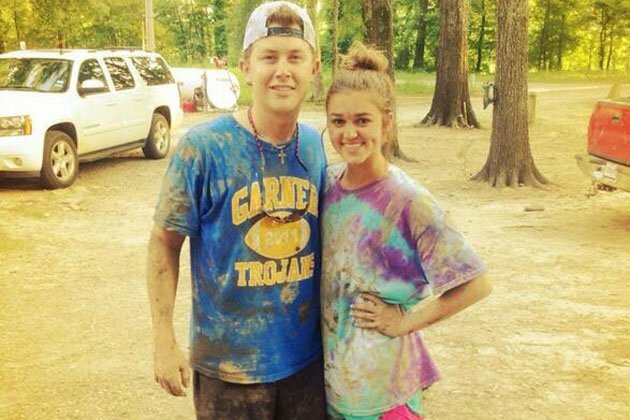 He was invited to play Sadie Robertson’s party and he accepted, thinking it’d be a surprise. Sadie Robertson knew all about it however, even requesting he play her favorite song, See You Tonight. “This boy made my birthday the best day of my life! So thankful that he came down for my party!” she wrote on Twitter. The day before, the singer and his bandmates went mudding in John Luke Robertson’s jeep and several four-wheelers. Later, they enjoyed friend shrimp and banana pudding before spending the night at the family’s home. “I was blown away by their hospitality,” Scotty McCreery says.